Veterinarian Cami Anderson has hit a rough patch. Stymied by her recent divorce, she wonders if there are secret ingredients to a happy, long-lasting marriage or if the entire institution is outdated and obsolete. Couples all around her are approaching important milestones. Her parents are preparing to celebrate their fiftieth anniversary. Her brother and his partner find their marriage dreams legally blocked. Her former sister-in-law—still her best friend—is newly engaged. The youthfully exuberant romance of her teenage daughter is developing complications. And three separate men—including her ex-husband—are becoming entangled in Cami’s messy post-marital love life. But as she struggles to come to terms with her own doubts amid this chaotic circus of relationships, Cami finds strange comfort in an unexpected confidant: an angry, unpredictable horse in her care. With the help of her equine soul mate, she begins to make sense of marriage’s great mysteries—and its disconnects. 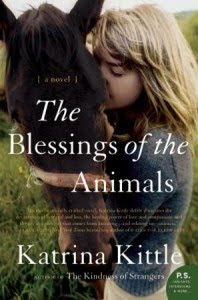 I loved the story that is woven throughout the pages of this novel, The Blessings Of The Animals by Katrina Kittle even though there are elements about it you may not care for. One of these is the gay marriage between Cami's brother Davy to his partner David and their subsequent attempted adoption of a child. This is something that goes against my beliefs but I found that I could still enjoy the story of Cami and her daughter, Gabriella, as they struggle to find a way to keep their farm intact while going through a rough divorce from her ex husband Bobby. Since dealing with this exact situation in my own personal life, I could relate to Cami's struggle to see her husband leaving and divorcing her as something as a blessing of a life to come. The wonderful parallel between a horse she has rescued from an abusive woman as part of an animal control raid, teaches her through the love and compassion of caring for a wounded horse, that she too can learn to trust and love again. There are so many great parts of this book, between all the animals that Cami gets stuck with caring for when no one else will and besides the horse, Moonshot, is the relationship she has with Muriel her beloved goat. This story truly is a must read for anyone that has that unique connection with animals and the love that coexists between us and them in our own language of love. I received this book compliments of TLC Book Tours for my honest review and would still rate this one a 5 out of 5 stars for the story content. TLC Book Tours is offering one lucky follower a chance to win a copy of the book, simply by leaving me a comment telling me one of your favorite animals and why. You must be a resident of the US or Canada and No P.O. Boxes please. I must have a way to contact you, so please include your email in the comment. The giveaway will end on August 10th. I will contact the winner by email. Also Katrina Kittle will be on Blog Talk Radio with Book Club Girl (actually, with Book Club Girl's co-worker, Erica) on August 26th at 7pm ET? 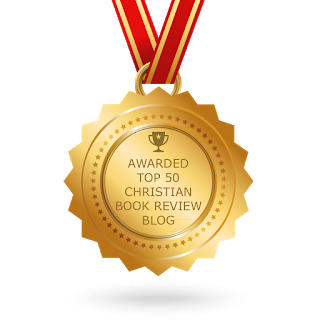 Here's the link: http://www.blogtalkradio.com/book-club-girl/2010/08/26/katrina-kittle-discusses-the-blessings-of-the-animals. I know I would enjoy this book. I would love to read this, please count me in. I love cats, especially the way they curl up and just love you, no matter what. They somehow seem to know if you need a little extra loving. 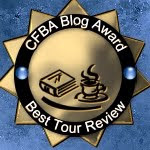 I like your blog, would love to read the book. I don't have a chance to get near dogs or cats because I am ao allergice to them. It's a drag. our family had a dog while I was growing up and I loved that dog, but I was sick a lot of the time with asthma during my younger life. I have always loved horses and would love to win this book....but since hubs won't let me have a horse in the house....I have my cats! This sounds like a great book! My favorite animal is a dog. 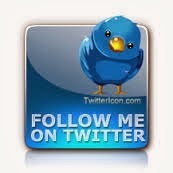 I am a follower. I don't know what I'd do without my toy poodle, she is so loving. I'd get another, that's what. I especially love dogs. They are so faithful and loyal, so protective of their owners. They're affectionate and always greet you at the door when you return home. I'm glad that you enjoyed this one despite having some issues with part of the story. It sounds like a great read! Thanks for being a part of the tour. My favorite animals are our two English Cocker Spaniels Toby and Shelby! Would love to read this. I have an 11 year old persian cat named Juniper. What a wonderful opportunity to read such a great book. Thank you for the fine review. I, like you, am not comfortable with part of it, but the story sounds wonderful, revealing God working in her life. I'd appreciate being entered in the drawing. I would love to read this book, particurly about the abused horse. I am a dog person but any story about rescusing a abused animal touches my heart.